Pictured are, back row, Danny Haley and Ken Vickers. and front Row, Jimmy Ramsey, Larry Wise and Andy Burklow. 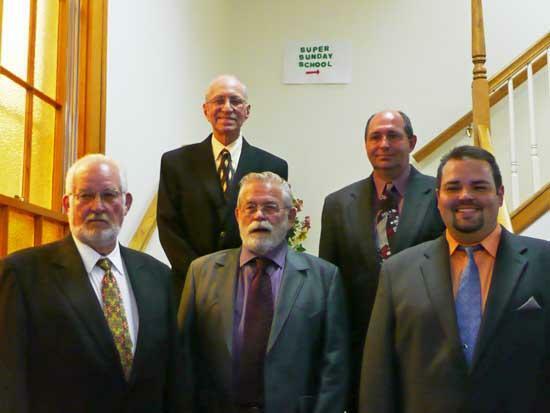 On Sunday, May 15, five men gathered to be ordained to serve as deacons for Sycamore Baptist Church. Pastor Richard Williams, greeted the congregation and offered a prayer for blessings on these men. Deacon Gerald Petro introduced the candidates and recommended that the men be ordained. Pastor Williams read 1 Timothy 3:8-13 to remind those involved of the qualifications and duties of the office. Deacon Jim Jones guided the following men through the Deacons' Vow: Jimmy Ramsey, Larry Wise, Andy Burklow, Danny Haley, and Ken Vickers. Director for the Salem Baptist Association, Bro. Thomas Baines gave the charge to the candidates. Special music was presented by Dottie Jones,David Vanatta, Jim Jones, and Jimmy Ramsey. The church membership then took an oath to pray and support the newly elected deacons as they worked with the church. Deacon Joe Bryson lead the group in prayer and the candidates knelt as each ordained man (deacon or minister) came to lay hands on each and ask God's blessings on their lives and their work. The wives of these men came forward and were presented roses by Dottie Jones. It is expected that each of these ladies will be strong support for her husband as he fills this office. Deacon Gerald Petro offered a closing prayer. Light refreshments were served in Fellowship Hall.